Today Only Deal -15% Off (Up to $100) on All Nikon Gears at eBay ! Hot Deal – Refurbished AF-S NIKKOR 24-120mm f/4G ED VR Lens for $519 at Adorama ! Nikon USA authorized dealer Adorama Camera has a hot deal on refurbished AF-S NIKKOR 24-120mm f/4G ED VR lens for $519.95. Currently lowest price online ever, coming with 90-day Nikon USA warranty. 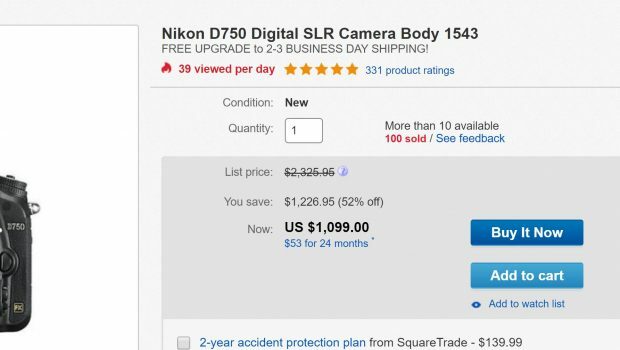 eBay USA top rated seller quickndone has a hot deal of Nikon D750 body for $1,099.00. Currently lowest price online ever. Regular price for Nikon D750 body is $1,696.95 at most US stores. Nikon USA authorized dealer Best Buy has a hot deal on AF-S NIKKOR 24-70mm f/2.8G ED lens for $1,439.99. Currently lowest price online from authorized dealers.